Area rugs are implemented for many different reasons, but primarily, they are used to add protection to the flooring and accessorize the room. Area rugs, because of their main purpose, will often endure heavy foot traffic and abuse and before too long, the area rugs will look beyond their years, suffer expedited wear and tear, and lose longevity, as well as contribute to poor indoor air quality and bring the overall aesthetics of the room down, no matter how clean and polished it is. Leading Carpet Cleaning would like to take the opportunity to share some advice on tips on how to care and properly clean your area rugs. For area rugs that do not require specialized cleaning, below you will see how to keep your area rugs clean and in optimal condition. 1) Routine Area Rug Vacuuming: Area rugs need to be vacuumed daily or more so if the occasion calls for it. Keeping the dirt from compacting below the surface will keep it from matting and looking dingy. There are some vacuums that feature an “area rug” setting, if this applies, take advantage, otherwise select the appropriate setting for the length of the fibers. Avoid running the vacuum over any decorative fringe, as vacuuming it can fray the fringes along with other damages. Vacuuming rugs better maintain the dirt saturation and reduce the buildup. 2) Remove Pet Hair on Area Rugs: Vacuuming isn’t always adequate to ensure the hair is removed. Whether you have pet hair/fur, or human hair from shedding, the hair mars the appearance and contributes to the debris, causing friction. Periodically, brush out hair that may have compiled on your rug in the direction of the nap, and throw away the clumps. 3) Keep Area Rugs Rotated: Area rugs should be rotates 2-4 times a year, depending on traffic patterns and sun exposure. Sun light fades your rugs colors and dries them out, heavy traffic patterns increases wear and by rotating the area rugs; you can even out the wear. 4) Shake Area Rugs Out: Smaller rugs that are easily manipulated can be taken outside and shaken well to remove excess dirt and debris that is deep in the fibers and if they have mild odors, leaving them outside for a couple hours can help release the stagnant odors and help them smell fresh. Be sure to read the tag and follow the directions as some rugs require special cleaning and care instructions. 1) Handmade & Antique Rugs. Start by placing a nylon screen on top of your rug. 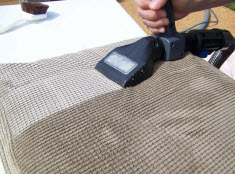 Using your vacuum’s hose and attachment, vacuum the rug through the screen. These rugs are extremely fragile and require delicate handling and cleaning; if you are not comfortable, invest in a professional cleaning. 2) Braided Area Rugs. Lay a blanket or some towels down on a solid surface that will not be affected by water off to the side. Put the braided rug on a hard surface floor that can get wet. Generously sponge your preferred rug cleaning detergent according to the labels directions onto the rug and work it in well. Rinse the rug thoroughly. On dry blankets or towels set the clean rug on top until it is completely dry. 3) Fur or Sheepskin Rugs. Start by sprinkling talcum powder onto the rug. Brush the rug in detail. Once you have completed that step, take the rug outside and shake vigorously until no more debris falls. You may have to repeat of the debris is compacted, or fur is longer. For an annual deep cleaning, contact a professional from Leading Carpet Cleaning to ensure the area rugs are cleaned, sanitized, and deodorized. Contact us today! Air Duct Cleaning FAQ in Anaheim, CA; How Often Should Air Ducts Be Cleaned & More? Indoor air quality is becoming more and more recognized as something everyone should be conscious of. Considering the average American spends 90% of the day indoors, the air you are breathing can impact your health, especially those who have asthma, allergies, or other respiratory issues. One of the things that homeowners, and even business owners, can do is to get the air ducts cleaned every 3-5 years. Today, we at Leading Carpet Cleaning would like to take the opportunity to answer the most common of the frequently asked questions concerning air duct cleaning. Question: Can mold grow in air ducts, if so, is it harmful? Answer: Yes mold can grow in air ducts. Mold spores can mature with warm temperatures, optimal humidity levels, dark areas, and a food source. The dust flowing through the air duct system is a banquet if mold develops; giving it the adequate food to sustain itself. The dark space and ideal climate conditions make the air ducts a perfect home. Mold can be harmful by triggering allergies or asthma attacks, and after long term exposure many individuals develop flu-like symptoms. If mold grows in the air ducts, it derived from another source. Question: What accumulates in the air ducts that require cleaning? Answer: Environmental and climate conditions as well as the different variables of the indoor living conditions are a factor. Air ducts filter the air that was once outside which consists of dust, chemicals, pollens, pollutants, insects and mold spores. Indoor air that filters through could include, dead skin cells, human hair, pet hair/fur and dander, pesticides, cigarette/cigar smoke, cooking particles, and personal care products. Any renovations, upgrades, remodeling, or projects can contribute to any construction related particles such as; wood products, fire place soot, metal shavings, carpet fibers, and plastics distributing pollutants. Rain water can find be introduced to the air ducts in the event any leak problems manifest. Question: Are there any health benefits to routine air duct cleaning? Answer: There are many benefits to ensuring your air ducts are thoroughly cleaned every 3-5 years. The HVAC system (heating, ventilation, and air conditioning system) operates at increased efficiency. With enhanced performance the energy consumption drops, reducing your bill, indoor air quality is improved, and those with allergy, asthma, and respiratory can find relief. Question: Can the home’s energy bill be reduced with air duct cleaning? Answer: Potentially, yes. Research by the U.S. EPA has proven that a clean air duct system can run more efficiently, and put less strain on your moving parts; contributing to less energy consumption, saving you some cash on the bills. Question: How frequently should the air ducts be professionally cleaned? Answer: There are a few contributing factors that dictate the frequency of professional services. Research suggests that air ducts should be professionally cleaned every 3-5 years. The more that applies to your lifestyle from the list below implies the sooner you should get it done. –	Occupants that suffer from respiratory problems, allergies, or asthma. –	Following home remodeling or renovations. –	Just before you move in to a new home. –	Elemental Damage; Fire, smoke, or water damage. If your Orange County home or business is in need of an air duct cleaning, contact Leading Carpet Cleaning today and let our experts get started! Most people believe that cleaning hardwood floors is a difficult task. Due to the many horror stories of people improperly cleaning wood leads many to fear the task when in fact it is much easier than most realize. The one rule is to never use too much water because you can damage your floors. Leading Carpet Cleaning will help put your fears to rest and explain how to properly clean and maintain your hardwood floors. Always clean the dust off of your floors first. You should actually use a dust mop on hardwood floors as a part of your weekly cleaning and only wash the floor as they need it. Don’t vacuum or use a regular broom with rough bristles, always use softer materials like a fabric dust mop or even a soft bristled broom on your hardwood floors. To maintain your floor means to regularly clean the dirt, pet hair, and debris from off of your floors. Once dirt, oil and grime begins to build up on you floor, it is time for a deeper cleaning. Before washing the floor, dust mop or sweep your floors. When washing the floor you can use straight water or water with a little bit of vinegar if you like. If you use vinegar, mix together about 1 cup of vinegar to 1 gallon of water. With a mop or sponge mop squeeze out as much of the water as you can until the mop or sponge is lightly dampened. Never over soak the mop for washing wood floors because too much water can actually damage the floor instead of cleaning them. Also you don’t want to walk on your wood floor so when you are cleaning your floor there is two importand considerations. One – work your way out of the room and not into a corner and secondly, clean with the grain of the wood. Make sure to rinse the mop or sponge often. This is all it takes for deep cleaning your hardwood floor. Marks can often appear over time and depending on want caused the mark can determine how to properly clean or remover these nasty blemishes from off your floors. – Marks such as dark spots or pet stains will require some Number 000 steel wool and floor wax to rub away the mark. For the dark spots use bleach or vinegar. Soak a cloth and dab at the spot until it is also most soaked. Afterward allow the vinegar or bleach to soak for an hour and then wipe clean with a damp wet cloth. – Heel marks are annoying when they occur. However, all you will need to remove the heel mark is the same number 000 steel wool and then rub in some floor wax. – For water marks, use the same method as heel marks unless–as in some cases–the water stain is much deeper than just the surface. If so, you may need to lightly sand the water stain down to open up the pores of the wood. After you sand, apply odorless mineral spirits with the same steel wool. – For grease stains or oil based stains, use a damp cloth with regular liquid dish soap to help break down the grease or oil. After rubbing the areas clean, rinse with straight water using a cloth. Afterwards lightly sand down the area to help smooth out the surface of the wood. 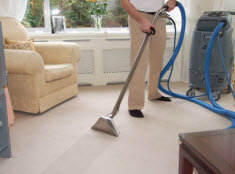 Leading Carpet Cleaning hopes we were able to help make what may seem difficult an easier task to handle. If your hardwood floors are in need of refinishing or deep cleaning, contact Leading Carpet Cleaning. We provide many services that help aid any home including hardwood floor services. Contact us today. There are a number of manmade and natural stone tiles available on the market to surface the various places in any home. The most commonly used is porcelain and ceramic tiles due to the versatility, cost efficiency, and easy maintenance. With that in mind, we at Leading Carpet Cleaning would like to share some tips and advice on cleaning ceramic tile, porcelain tile, and grout. 1. Especially ensuring the edges and corners as they have a tendency to buildup debris; remove the surface of dirt and grime. Microfiber dust mops are optimal, vacuuming on the bare floor setting, or even a broom are handy options to thoroughly remove all the grit. 2. Always follow manufacturer’s directions when using a department pre-made cleaner. If it is not concentrated, pre-treat your porcelain tile floor with a hot water rinse can help loosen the grime. Mix a gallon of warm water with ½ cup of white vinegar, if you prefer home remedies. 3. Scrub your floors down with a medium firmness, vinyl bristled brush using your cleaner and circular patterns. 4. Wipe up the any remnants and residues with a clean damp cloth and warm water. 5. Generally, porcelain is stain-resistant, however stains can still occur and if any stains do remain, concentrate your efforts in that specific area with previous steps. 6. Allow surface to dry. 1. Extract the dirt; make certain the edges and corners are not neglected and all accumulating debris is cleared away. Microfiber dust mop, soft bristle broom, or a vacuum on bare floor setting are all acceptable methods to thoroughly remove the debris. 2. Combine a gallon of warm water with 2 Tbsp of mild liquid dish soap. If the water begins looking cloudy as you mop the floor, change the water solution to avoid recontamination, sticky and/or soapy residue buildup. If your preference is a premade blend, follow the label for proper directions. 3. Allow to fully air dry before allowing traffic or replacing area rugs or light furniture you may have removed before you began. You will need some serious cleaning power if your grout is particularly stained, and the most popular method is with bleach and baking soda. However, conduct a patch test in an inconspicuous place to ensure it will not compromise the actual color of your grout as this concoction has the capability to lighten colors. If you opt to utilize this method, we strongly recommended you wear a breathing mask, safety glasses and cleaning gloves. 1. Form a paste combining approximately ¾ cups baking soda with ¼ cup bleach. 2. For methodical execution for time efficiency and thoroughness, conduct the application in a grid pattern if the space is large, allow the mixture to set 10-15 minutes. Using a designated toothbrush or firm bristled brush, scrub the mixture into the grout with circular motions and allow it to set 10-15 more minutes. 3. Wipe clean with a warm cloth. 4. Keep in mind that grout is dark when it’s wet; wait until it is dry to determine if the steps need to be repeated. Tile & Grout Cleaning, Sealing & More in Orange, Santa Ana, Rancho Cucamonga, Anaheim, Whittier, Riverside, Chino & Fullerton California. 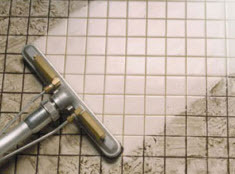 If the grout or tile does not seem to be achieving the ultimate level of clean or it is due for a deep professional tile and grout cleaning service, contact Leading Carpet Cleaning today and let our experts restore the shine and beauty of your tile and grout.